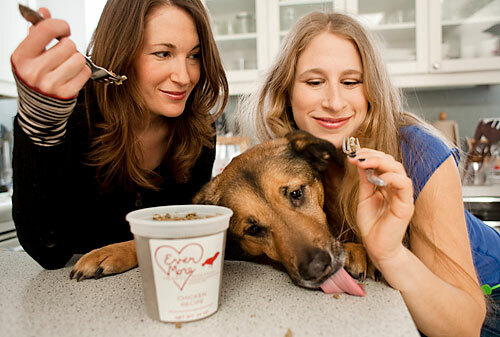 Alison Weiner and Hanna Mandelbaum, co-owners of Evermore Pet Food, will eat their own dog food for an entire month, in a bid to convince the world their product is one hundred percent organic and healthy. 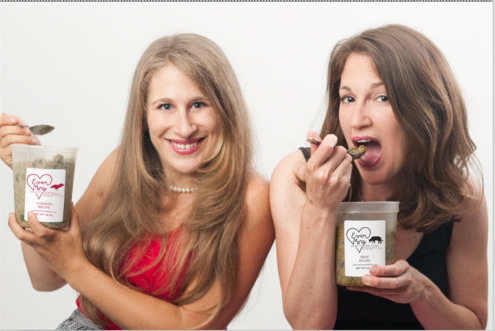 Hanna, 30, and Alison, 38, claim their dog food, which looks like mixed with chili, is made with meat from chicken and cows raised on farms where gourmet markets get their meat from, and that it’s completely antibiotics and hormones free. According to the duo “a lot of pet foods claim to be human grade, but none of those companies put their mouth where there money is,”, so they’ve decided to stand up to the challenge and eat their own dog food for an entire month, and document the experience on their website. Alison Wiener, who is a chef by training, says she and her friend couldn’t eat this dog food non-stop, because humans and canines have different nutritional requirements, with dogs needing a lot more protein, but they do eat at least one dog food meal a day. When they aren’t consuming the product they themselves created, the two women eat select ingredients that are actually found in the dog chow, like yams, kale, blueberries and dandelion greens. Although they admit their Evermore dog food isn’t exactly a delicacy for us humans, the two daredevils say “it really doesn’t taste that bad”. This unusual project began on March 1st and is set to end on March 31st. Angela and Hanna record their every dog food meal and post them on evermorepetfood.com.